Earn $1.19 in Rewards credit (119 points) What's This? Save up to 15% more. Nothing beats a pair of wool socks for cold weather riding. Made from high quality Australian Merino wool, the Woolie Boolie sock will keep you nice and toasty when the thermometer drops. The Woolie Boolie Sock is available in Black and features a 4 inch cuff. Made in the U.S.A. The best fitting and smelling socks! I have bought a total of three pair in the last two months. I commute to work daily and really on these socks to keep my feet healthy. I have mild foot problems and the comfort and fit is crucial. I like the fact that these socks stay warm in winter and cool in summer. They are the best all-around socks I've used for cycling. The durability is considerably better than some other name brand socks on the market. Plus, the wool blend keeps the odor out. I will be buying more of these socks to keep in the investment sock drawer. Thanks WBW!!! There is no better combo of comfort, durability, performance and price that the Woolies. I have numerous pairs and wear them on an off the bike. I've yet to wear a pair out. These socks fit well, wear well, and keep my feet warm! Great cool weather and winter socks. I have about 6 pairs of these now, ordering a couple of pairs every time I see them on sale, and have never put a hole in one or worn one out. I even wear these during my work day in my regular shoes to keep my feet warm during the winter. These are great for cold weather riding. They are thicker than summer socks so need to loosen your shoe straps from what is usual but keeps toes from freezing especially when paired with toe covers or booties depending on the day. Decided to try a pair of DeFeet for my cycling instead of Smartwool because of the cheaper pricing. They turned out to be as comfortable so would recommend them to others. I have 5 pair of these socks....They are awesome for riding in any weather! I wear a pair everyday to work, and for some reason my feet never hurt after a long day of standing on a concrete floor....that's why I wear them! I throw pair in here when I want to put an order over the limit to get the free shipping! Can't believe I would like a pair of socks so much. My road shoes are tight fitting and these are perfect to add some warmth without the bulk. I bought some more because they were so comfy I wear them all the time...and a great price point! Thick and comfortable with a great fit. Perfect for winter riding. Love these socks! Plan to order another pair! Use these socks for morning rides when the weather is in the 40 - 55 degree range. Keep my feet very comfortable. Launder very well. Plan to order several more pair. I wasn't sure I'd like a thicker sock, but for winter rides they are very comfortable. Also a nice sock to wear with street clothes, and even works as light-duty slippers! I plan to buy more. Great for cool weather, but they don't get too hot even when the temps are in the 60's. Merino is much better than anything synthetic I've used. I love em. Nothing beats wool. Make sure to size up, they never get bigger. 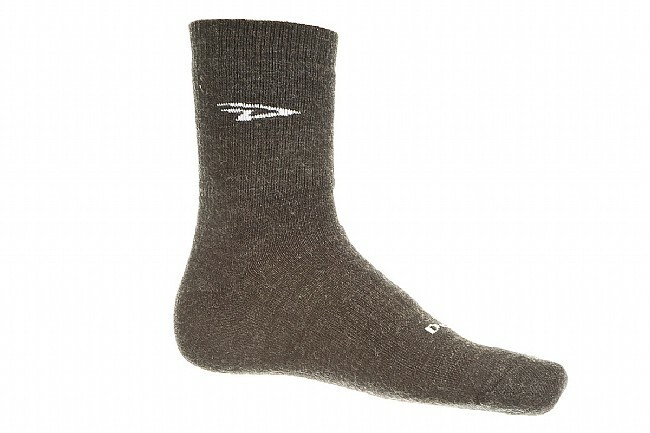 I purchase these wool sock when I brought a pair of the Pearl Izumi P.R.O. Softshell shoe covers. These are great as it feel very comfortable on the feet. It's not to thick to cause bulkiness. I wish I brought a longer cuff version also to keep the shin warm. Excellent quality sock. I've worn in 60 degree weather down to the 20s. They are a heavier sock but not overly thick. They do a good job keeping your feet dry. They could be a little taller for winter use, but otherwise excellent. Very warm and comfortable but a little thick for tight cycling shoes.